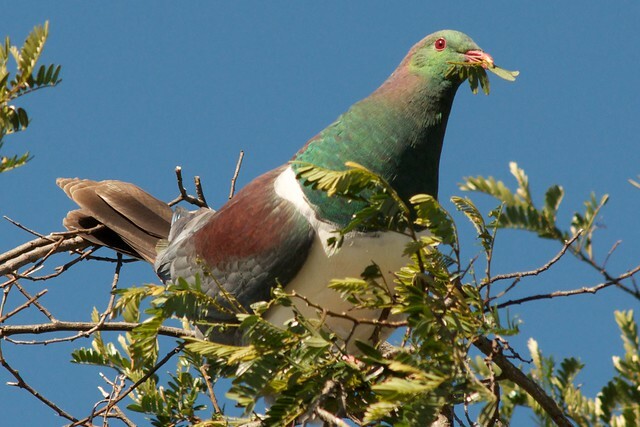 The Great Kererū Count is the largest national citizen science project to help gather information on the abundance and distribution of the New Zealand Pigeon — also known as kererū, kūkū or kūkupa. The Great Kererū Count will take place over 10 full days from 16 to 25 September 2016. It's the time for all New Zealanders to get together and do a population health check for these amazing birds. So get ready to get out and about and make your kererū count. NatureWatch NZ is the place for your kererū counts and you've got three ways to get your counts loaded in. Like everything on NatureWatch NZ, they're all free. You can enter your counts directly into the Great Kererū Count 2016 project on the NatureWatch NZ website at https://inaturalist.nz/projects/great-kereru-count-2016 This option is best if you're already hooked on NatureWatch NZ or are keen to become part of New Zealand's largest online community of nature watchers. Use NatureWatch NZ if you've got photos of your counted kererū to share. NatureWatch NZ users can also count on the go by logging into NatureWatch NZ from the iNaturalist app (Android, iOS). This is a great way to quickly upload kererū photos taken on your smart phone. If you're in a rush or don't want to deal with the hassle of signing up for NatureWatch NZ, you can add your observations to the web form on the Great Kererū Count website at http://greatkererucount.nz/ Their web form loads your counts into NatureWatch NZ too, but it does so anonymously and without the ability to add photos. It's built for you flyby kererū counters out there who are keen to quickly share a kererū count then get back to your busy lives until next year's count. The Great Kereru Count people have put together some nice detailed instructions for each of those options if you're a first time kererū counter or in case you run into any problems getting started. The NatureWatch NZ team will also be available, as we always are, at help@inaturalist.nz. Our colleagues at Victoria University in Wellington have been busy analysing the results of last year's mighty kererū count. You can read about their findings in their report here (although, caution, it's not light bedtime reading). The more people get involved, and the more years the kererū count runs, the more we'll learn.